We solemnly swear to avoid puns in this review. KEF are legendary. The speaker maker has been wowing listeners for quite some time, with models like the LS50 and LS50 Wireless that offer some truly magnificent sound. 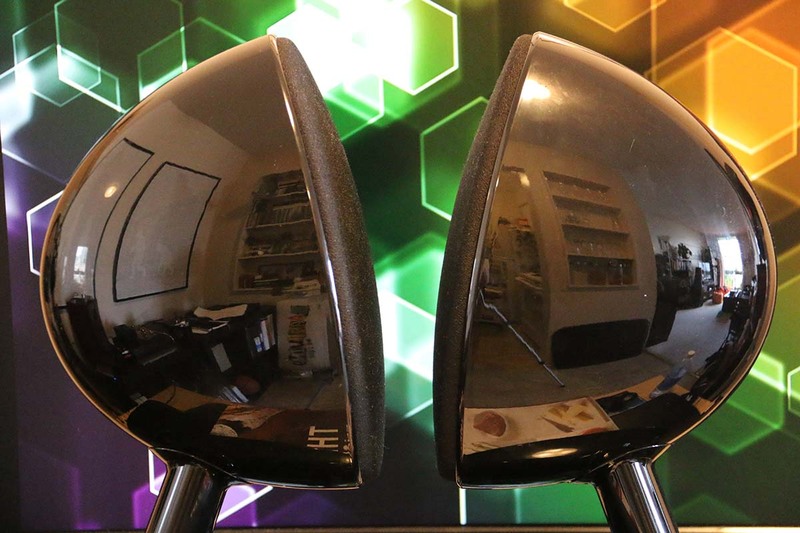 We were curious, then, when they offered to send us a pair of their EGG wireless speakers, which we hadn’t heard yet – and not just because for the first time in possibly ever, a piece of audio equipment was shaped exactly like its name. In this review, we break down the EGG’s sound, design, packaging and accessories, specs and more. To see how they stack up, see our list of the best computer speakers. Like we said: EGG. That’s EGG singular – despite the fact that there are two of these, the KEF EGG is singular, a rather optimistic naming choice by the company’s marketing department. It’s their shape that is the most defining thing about these speakers, and it’s their shape we’re going to talk about first. We had high hopes for these, especially given KEF’s pedigree. Unfortunately, things didn’t work out quite as well as we hoped. Let’s talk about the good things first. The drivers in the EGGs are actually quite clever – it’s a system called Uni-Q, which incorporates a 0.75” tweeter directly in the middle of a 4.25” aluminum midrange driver, which handles the bass frequencies too. Not only do they look really good, but the effect they offer is that of a speaker without a sweetspot. To explain: every time you set up a pair of speakers, there will be a place in your listening room where the sound is ‘right’ – where you’re getting the full effect. Often, it’s an area no more than a foot or two across, right where the sound coming from both sets of drivers intersects and interplays in the best possible way. The downside of this is that sometimes finding the sweet spot can be a giant pain – and when you do, it’s not where you want it to be. A perfect example are the otherwise excellent Audioengine HD3 speakers (full review here) - they sound great, but have a surprisingly narrow sweet spot. They are also $100 cheaper than the KEF, at $399, so we’re not going to get too hung up on it. The Uni-Q system deals with the problem of having a sweet spot. No matter where we positioned the two speakers, no matter what other stuff was around, above, or behind them, the sound remained more or less the same everywhere in the room. It’s a very neat trick, and even when we started crawling around on the floor, we didn’t notice a discernible difference in the sound. Once we experienced it, we were left wondering why more speaker manufacturers don’t give something like this a try. It works incredibly well – and the level of science and research that has gone into making sure that the sound stays constant regardless of listener position is pretty impressive. The tweeter, for example, is vented to prevent pressure from the sound levels building up behind it, and the construction materials are stiff enough to prevent unwanted vibrations. As wireless speakers go, this particular tech is very welcome. Unfortunately, simply because the sound was unchanged no matter where we were, doesn’t mean it blew our minds. We need to be clear: the sound was fine. It ticked all the boxes. It showed us a relatively clear, unbiased, balanced picture of what was happening in the music, without skimping on the detail. At no time did we feel like we were losing anything by playing music through the EGGs. They got the job done. But that’s just it: they never went above and beyond. We weren’t asking them to utterly destroy our conceptions about sound quality, but we also expected something a little more exciting. They never wowed us, never raised our heartbeat, never did anything to make us sit back and marvel at their capabilities (outside of the sweet spot thing, which even now we think is pretty cool). As a comparison: we recently reviewed the Paradigm PW 600, a wireless speaker with a similar price and functionality. It had many more design flaws than the EGGs, but we ended up loving the overall sound quality. The two aren’t a direct comparison, but if nothing else, the PW-600 is proof that wireless speakers can really wow us. The EGGs just…don’t. The lows were tight and controlled, while the mids and highs felt perfectly capable and articulate. But whatever genres we played through these, or whatever movies we watched, the sound never got beyond an 8/10. Although, we did feel there was a slight improvement when playing through USB. There’s nothing wrong with that – it’s perfectly OK to have capable if unspectacular sound. We just kind of expected a little more from these. Something that looks this cool shouldn’t sound this meh. We found ourselves reverting to our basic house SONOS PLAY:3 system (full review here) for day-to-day use – while it wasn’t nearly as balanced as the EGGs, and definitely offered less power, it also felt a little bit more lively and enjoyable to listen to. It’s also around half the price, at $250. So, that’s a big knock for the EGGs. Again: there’s nothing wrong here. There are no major deficiencies in the sound, or things that make us scratch our heads. It just doesn’t do anything spectacular. Playing our test tracks left us a little bored, checking Facebook and wondering what we should eat for dinner. KEF have proved they can do amazing things - but unfortunately, the sound of the EGGs doesn’t qualify. You could make an argument that the extended sweet spot was enough to separate this speaker from others - but while it's a nice technological trick, there's little point too it if the sound is unexciting to begin with. The speakers were larger than we expected, nearly a foot high, with each half-egg-shaped section balanced on a sturdy base. The shape is eye-catching, and plenty of people who passed through our office ended up commenting on them, in a way they didn’t when they spotted the various amps, headphones and bookshelf speakers we had lying around. The shape has its roots in the company’s famed KHT 5.1 system from 2005, and there’s no denying that it’s effective. Whether the EGGs - sorry, we can’t be bothered to mess around with singular/plural here - were positioned on either side of an external monitor or TV, they fitted right in. At a time when so many speakers are boring boxes, the shape makes a real difference. It’s functional, too. Removing the grilles is easy enough – they pop right off – and this exposes a sleek silver set of drivers, of which we’ll talk about more in a moment. When setting up the speakers, one acts as a master, and the other as a slave, with the two joined by a short cable. We did have a slight issue disconnecting this cable while moving the speakers, with the connector housing sliding off, but we were pretty sure this was due to mishandling by a previous reviewer, rather than any build quality issues. In fact, the build quality as a whole was terrific. These may be made of plastic, but they feel solid, with no flimsy bits. As a bonus, they come in one of three colours – ours were black, but there are blue and white options available as well. The connection ports are all around the back, and offer several other options to the regular aptX-enabled Bluetooth. There’s a USB connection, for incorporating directly into an existing PC or laptop system, a subwoofer input – something which we were delighted to discover – and an auxiliary input on the slave speaker. All in all, it’s well laid out and easy-to-use, state of affairs helped along by the buttons on the front of the master speaker. We’ll talk about the remote in a minute, but the set of clicky buttons on the front of the speaker do the job just as well. A single LED on the front flashes multiple colors to indicate various states, ranging from a slow blink during Bluetooth pairing to a variety of shades to indicate input. It’s a simple system, and it works very well. Bluetooth pairing with multiple devices, including an Astell & Kern AK380 (full review here), was simple and effective. There were no dropouts, either, which is sometimes a problem we’ve had with other wireless speakers. The main accessory here, outside of an assortment of perfectly functional cables, is the remote. We rather liked it. Although we did have the occasional incident where the speaker didn’t want to register button pushes, this didn’t happen very often. For the most part, the remote worked well. It’s a sensibly-sized, well-built piece of plastic with eight buttons on the front that are easy to identify. Switching inputs was a breeze, and we liked the fact that there was a mute button, which is something not all speaker controls have. The EGGs’ manual made things even simpler, with a set of pictographic instructions that were easy to follow. We quite liked the packaging the EGGs came in. It didn’t do anything out of the ordinary – it’s just a simple cardboard box, with the usual Styrofoam inserts – but it’s long rectangular shape and outside design made us eager to open the box. We are big proponents of the idea that the experience of a piece of equipment starts the moment the Amazon delivery guy arrives at your door, and these do a good job of raising the excitement. There’s an extended sweet spot with the KEF EGG that makes it/them a joy to listen to. We really like the eye-catching design here, which is unusual and fun. ​The functionality of the speakers is excellent, as is the solid Bluetooth connection. The KEF EGG has boring, uninspired sound quality. The price is a little too high right now, despite the fact that the speakers are quite old. There are quite simply better, more cost-effective options available. There are plenty of speakers that challenge KEF here. Let’s start with the Fluance Fi70. doesn’t look nearly as good as the EGGs – in fact, if we’re being honest, it looks a bit like a probe from a robot race, sent down to enslave humanity. But there’s no denying that it sounds solid. Fluance’s wireless speaker can really fill a room, and at the same price as the EGGs, it’s a worthy alternative. Like them, it’s aptX-enabled, and the array of drivers means that it delivers sound with a little more oomph. It’s not the best wireless speaker available, but we think it’s an excellent choice – although you aren’t going to be switching this between desktop and TV, that’s for sure. It’s identically priced to the EGGs, at $500. Remember how we talked about exciting sound? The BlueSound Pulse Mini offers that, in spades. BlueSound’s little beauty delivers high-definition audio, with crystal-clear, intriguing sound quality, and we think that for a dollar less, you can’t go wrong here. Don’t expect design to match the EGGs, though. The Pulse Mini sounds terrific, but we think the EGGs have better design and functionality. All the same, this is where we’d go if we wanted more explosive wireless audio. Back to the EGGs for a moment. If you’re in the market for a set of wireless speakers, these will do you fine. They will get the job done. You won’t regret your purchase, and if you are visually inclined, these will slot right into just about any room you put them in. Your significant other won’t mind them hanging around. In certain circumstances – like improving basic TV sound, or on either side of a laptop – they work very well. There is a lot to recommend them. There’s no denying that. But sound quality is the biggest factor in anything we review, absolutely and without question, and we frown upon boring sound. KEF have consistently proven that they are among the best in the business, but we can’t help feeling that they didn’t do as good a job as they could have done here. And at $500 for the pair, we think the EGGs should offer a better experience than they currently do.